In A.D. 8 the poet Ovid (Publius Ovidius Naso, 43 B.C.–A.D. 17/18), author of Metamorphoses, was banished from Rome for life by Emperor Augustus and sent to the coast of the Black Sea, at Tomis or Tomi, present-day Constantsa, Romania. He recounted his exile in Tristia and Epistulae ex Ponto; the reason behind the punishment is unknown. 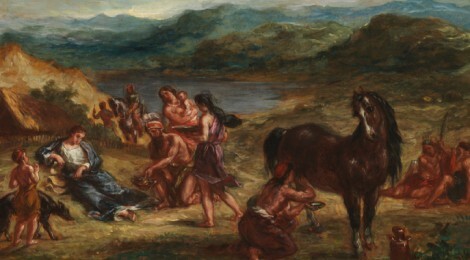 Delacroix’s first treatment of this subject—the artist alone, misunderstood, and unappreciated—was an oil sketch (whereabouts unknown), based on which his assistant Louis de Planet (1814–1875) completed the pendentive painting in the cupola devoted to the theme of poetry in the Library of the Palais Bourbon, Paris, about 1844 (see Maurice Sérullaz, Les peintures murales de Delacroix, Paris, 1963, pp. 57–59, 324, pl. 55). In an article published in Le Constitutionnel on January 31, 1848, Delacroix described the subject as follows: “He is seated sadly on the cold, naked earth, in a barbarian land. A Scythian family offers him simple gifts, mare’s milk, and wild fruit” (for trans. see Vincent Pomarède in Delacroix: The Late Work, exh. cat., Philadelphia, 1996, p. 234). The Greek historian Strabo (64 B.C.–A.D. 24) appears to be the ultimate source for the information that mare’s milk in various forms was “much relished” by the Scythians (as noted by Davies 1970). 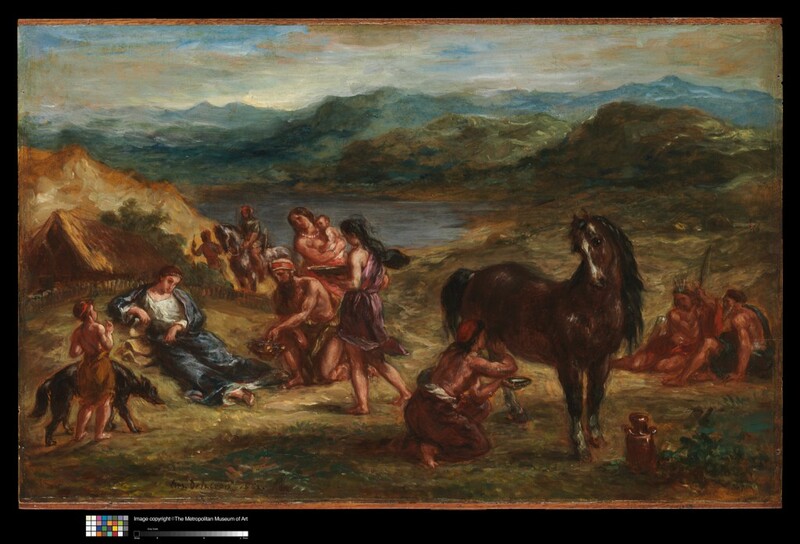 On April 10, 1849, Delacroix mentioned the subject in his journal, as one to which he might devote a painting, and about 1855–56 he worked up a drawing (Swiss private collection; see Stuffmann 2008, pp. 76–78, no. 26) and a closely related oil sketch (whereabouts unknown; Johnson 1986, no. 318). In 1856 his friend the banker Benoît Fould (1792–1858) commissioned him to execute a painting on this theme. The resulting canvas (National Gallery, London, NG 6262; Johnson 1986, no. 334) was completed in early 1859, after Fould’s death, but his widow graciously accepted her late husband’s commitment, paying Delacroix 6,000 francs for the painting and offering to make it available for that year’s Salon. The catalogue offered the following description: “Ovid in exile among the Scythians. Some examine him with curiosity, others welcome him in their own way, offering him mare’s milk, wild fruit, etc.” (see Pomarède 2001, p. 236). It was one of the few paintings by Delacroix in the 1859 Salon that was generally well received, and it inspired some of Charles Baudelaire’s most memorable lines: “And just as exile gave the brilliant poet that quality of sadness which he had hitherto lacked, so melancholy has clothed the painter’s superabundant landscape with its own magical gaze. . . ” and, a little further on “The mind sinks into it with a slow and appreciative rapture, as it would sink into the heavens, or into the sea’s horizon—into eyes brimming with thought, or a rich and fertile drift of reverie” (“Salon of 1859,” in Baudelaire: Art in Paris, 1845–1862, trans. and ed. Jonathan Mayne, London, 1965, p. 171). The Salon canvas is nearly three times larger than the Metropolitan’s version of 1862, a cabinet picture intended for a private collector, which was painted on paper, and the compositional scale has been altered, resulting in a very different effect. (The relative dimensions are 34 1/4 x 51 1/4 in., or 87.6 x 130 cm, for the London version, as compared to 12 5/8 x 19 3/4 in., or 32.1 x 50.2 cm, for the New York version.) The landscape in the later painting is not as “superabundant” as before, and the figures are proportionately larger. Delacroix retained the cruciform diagonal on which the perspective is based, but by placing the groupings closer together and nearer to the picture plane, he arrived at a more boldly frieze-like arrangement that is closer to the original drawing and oil sketch. Increased plasticity of form is also arrived at through a greater use of impasto. Delacroix did not mention the late variant—his final treatment of the theme of Ovid’s exile—in his journal or, as far as is known, in his letters. Its first owner was the Belgian industrialist François Alfred Mosselman (1810–1867), who may have acquired it directly from him or from a dealer. In either case, he did not have it for long: it was included in his collection sale on March 5, 1863, not six months before Delacroix died on August 13.